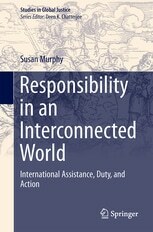 Responsibility in an Interconnected World: International Assistance, Duty, and Action, Susan P. Murphy (Switzerland: Springer International, 2016), 173 pp., $99.99 cloth. In Responsibility in an Interconnected World, Susan P. Murphy aims to provide a practical approach to charitable giving that is grounded in the moral duty to assist. Murphy is not interested in debating the existence of such a duty; rather, she takes it as given, and from there searches for the most appropriate guide for practicing assistance in a contemporary context. The book is motivated by an ongoing tug-of-war in the humanitarian and development assistance industry between two opposing philosophical perspectives: deontology and consequentialism. The former perspective emphasizes the importance of the intent of those who provide aid, while the latter stresses the actual effects of the aid. In the first half of the book Murphy carefully navigates this deontology-consequentialism divide, providing summary and critique of some of the leading accounts of the duty of assistance, including those of John Rawls and Peter Singer. These chapters hold much value for students of philosophy, though their dense terminology partly works against the author’s stated purpose of providing a practical and accessible ethic for the much wider audience of donors and practitioners. In the penultimate chapter, Murphy unpacks her core argument in great detail. As with the first half of the book, the thinking is sophisticated and nuanced. The author advocates a broad consequentialist, non-idealized, and interconnected approach. Murphy sees the duty to assist as an imperfect one, with the precise means of assistance for any given actor being open and inclusive. She also shies away from indicating which ends we are supposed to maximize, saying those too are context-dependent. Though this indeterminacy might irk strict consequentialists, others may view it as a strength of her approach given that it provides a flexible moral framework rather than imposing “a single right reason for acting and indeed a single right path to take” (p. 154). The final chapter, which examines two real-world cases—the 2010 cholera outbreak in Haiti and the 2011 famine in Somalia—is highly rewarding, succinctly illustrating many of Murphy’s main arguments. These cases are easy to grasp, and readers will intuitively understand why, for example, it is important to consider the needs of the people we seek to help; why it is not enough only to have good intent when it comes to giving charitably; or how well-meaning assistance gone wrong can sometimes create new moral obligations. If the implications for the nonprofit industry writ large are clear, however, the takeaway for individual donors is a bit less so. Murphy suggests that we have an almost infinite number of possibilities to choose from in fulfilling our duty of assistance. But our resources are finite, and choosing among many alternatives with limited information is difficult, especially when we may be morally on the hook if our good deed unintentionally causes harm. So how do we prioritize? For concrete answers, readers will have to turn elsewhere, but Responsibility in an Interconnected World is commendable for pushing us to think more holistically about the duty to assist.